The Community welcomes anyone who desires to find joy again and the meaning of their own lives through a Christian journey in life, which is simple but true. The first condition for entering Community is feeling the need for God and for others, and to see oneself as a poor sinner. 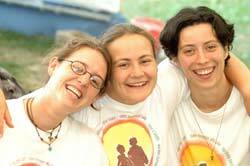 The greater part of the young people who have come to us in these years asking for help come from situations of distress and profound sadness, often from the world of drug addiction; others ask to spend a period of time dedicating themselves totally to others, seeing in our style of life a path that can help them understand the will of God… in short, the reasons for coming can be different, but the clear proposal of rebirth is unique: encountering the risen Jesus through a life of sharing, prayer, work, sacrifice and true friendship. For the men/women who wish to enter, some preliminary meetings during which one is made aware of the reality and the style of life of the Community, and where we verify the desire of the young man to change, learning about his real problems and assessing if we are able to help him. After a few meetings, the young man is invited to spend some working days from the morning until the evening in one of our Fraternities, and if he so desires, he is welcomed in the Community. There is no entry fee: nor are there any fixed fees; each family collaborates according to their capacity. We do not take in persons with psychological problems (schizophrenia, or serious mental disturbances): our experience during these years has taught us that our demanding and very regulated style of life, does not help such persons to resolve their problems, and neither are we able to provide them the constant special medical aid that of which they have need. Families who ask our help because they are touched by the cross of a child who is an addict are invited to participate in some meetings and other encounters with parents, which are held in various regions of Italy and the world, where our proposal of life is explained and where advice is given on how to help the child to choose life once again. In these meetings they meet other parents who, like them, had or have a son/daughter in Community, and they themselves begin a serious journey of conversion, which becomes a witness and a welcome to other wounded families in need of help. The “cross” of a drug addict child often becomes a reason for reflection, of deep conversion and of a renewed peace and family serenity. Would you like to do an experience with us? Many young people, in these last few years, even though they don’t come from dramatic experiences of isolation, have asked to spend a "strong" period of time with us. The Community offers to all, unconditionally, the same journey, convinced of the depth and the magnitude of the simple Christian everyday life. There are some conditions, gleaned from our experience of these years, which those who wish “to do an experience” are invited to accept that they may be able to draw fruit from this Community time.